Did these TV contestants know the answers to The 1975, Panic! and Blink 182 questions? We've all been there - you are just innocently sat on the sofa watching some daytime TV when, suddenly, out of nowhere, the quiz show announcer mentions your fave artist! Comedian Jo Caulfield came unstuck on a recent episode of Celebrity Mastermind, although, to be fair, maybe she was just thrown by seeing Matty refereed to as "Matt". Grounds for a recount we reckon. 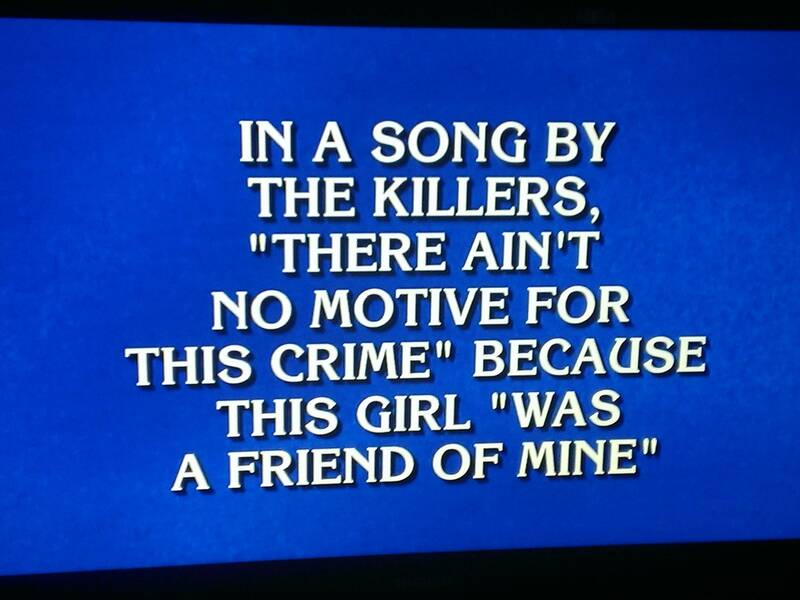 In the US, you aren't really famous unless you've appeared as an answer on Jeopardy and while this is basically just a Simpsons question, we reckon Pete Wentz would have been all over this moment. The man is on Hollywood Squares now for gods sake - he loves a game show! You tried, but you just didn't get there quickly enough Andy! Nice shout out for Mike too. Your face is "rather morbid and paradoxical". BOOM! So proud that they actually tweeted about it. Bless them. This is actually quite a tricky category although the showmakers do lose some points from us for not using a photo of Skrillex during his emo phase. Seen your fave pop up on a gameshow? Let us know below.